While the Grand Excursion has come and gone, the Mississippi River is as Grand as EVER! Order Vols 1 - 4 of DISCOVER! AMERICA's GREAT RIVER ROAD and follow the grandest river of all, enjoy community events, and perhaps, discover the Mississippi as your friend!! Click here to order your Discover! America's Great River Road Guidebook to the Mississippi River and Excursion 2004. Also New! True Tales of Steamboating history from Mike Gillespie (as seen on the HISTORY CHANNEL this past winter)! The Grand Excursion 2004 celebrated the renaissance of the Upper Mississippi region, by recreating the 1854 steamboat expedition that brought worldwide attention to what was then America's wild, western frontier. During Grand Excursion 2004, communities all along the 400-mile stretch of the Mississippi River ... from the Quad Cities of Iowa and Illinois through the bluffs of Wisconsin, to the Twin Cities of Minneapolis and St. Paul ... hosted cruises, celebrations and recreational and cultural events, as well as showcasing billions of dollar's worth of river revitalization projects. The centerpiece of the Grand Excursion was an historic steamboat flotilla that will retraced the original Grand Excursion's history-making journey. The historic route began in the Quad Cities on June 25, and traveled through four states and over 50 communities, arriving Minneapolis/St. Paul on the 4th of July weekend. 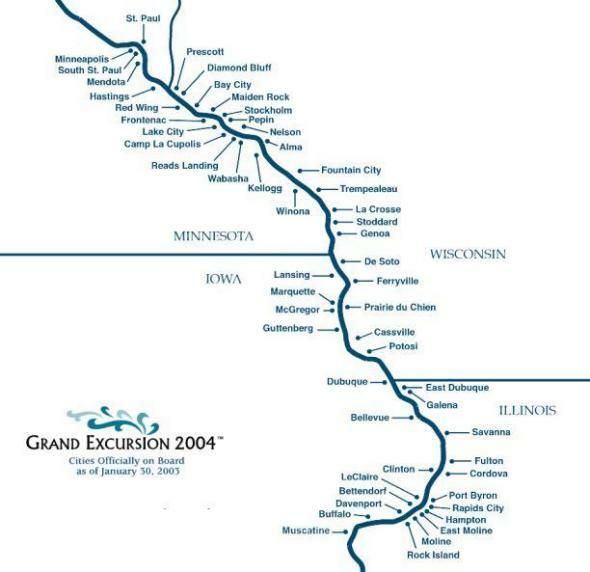 The year 2004 marks the sesquicentennial of the Grand Excursion that took place on the upper Mississippi River in 1854. The Grand Excursion took place when the first railroad reached the Mississippi River at Dunlieth, Illinois (across from Dubuque, Iowa). This arrival sparked a wave of interest in easterners who wanted to see the West without having to endure the hardships of slower means of travel. The group who participated came west by train to Chicago and on to Dunlieth. There they rode the riverboats north to St. Paul, Minnesota. Many wealthy and influential people of New York made the journey, highlighted by former President Millard Fillmore and his daughter. It was a grand affair, involving seven steamboats lead by the new Steamer War Eagle. The flotilla included stops at many of the river towns along the way and offered side trips to the points of interest, like Maiden Rock, Trempealeau Mountain, and the Falls of St. Anthony. 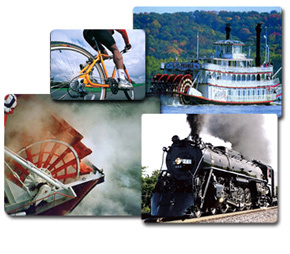 This summer of 2004, June 25 through July 5, you can retrace some or all of the Grand Excursion, as numerous riverboats along the route will be following the historic course. If you are interested in seeing some of the most beautiful scenery along the Mississippi River from a riverboat, perhaps this is the time to follow in the wake of our predecessors of 1854. The choices ranged widely from the Delta Queen or Mississippi Queen from St. Louis to St. Paul and short day trips, lunch, dinner and moonlight cruises, and some overnight trips on boats such as the Julia Belle Swain, Spirit of Peoria, Celebration Belle, Harriet Bishop, and the Anson Northrup.